Door County, Wisconsin, or Harbor Country, Michigan. Which getaway is more your speed? WHERE IT IS “Harbor Country” was trademarked in 1981, encompassing eight southwest Michigan towns 75 minutes from Chicago. SCENERY The Midwest’s answer to Martha’s Vineyard, this heavily wooded, occasionally swampy area boasts serene beaches and verdant farms. VACATIONERS Upper-crust Chicagoans buy summer cottages and slightly less-well-to-do city folk stay overnight at hotels and rental houses. 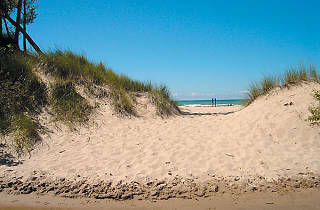 BEACH Warren Dunes State Park, featuring 250-foot-high sandy hills, includes nearly 2,000 acres along Lake Michigan and six miles of wooded hiking trails. (269-426-4013). BUY Opt for a nautical wall hanging at Alan Robandt, a well-priced vintage-furniture store featuring delicate, odd objects. It’s 30 minutes east of Harbor Country, but we won’t tell. 114 E Front St, Buchanan (312-560-7482). WHAT’S UNIQUE Harbor Country’s swimmable shoreline boasts Lake Michigan’s warmest waters. The shallower lake and eastward winds often leave summer water temps hovering around 70 degrees. DON’T LEAVE WITHOUT… sinking your teeth into a juicy cheeseburger at Redamak’s, a 34-year-old institution. 616 E Buffalo St, New Buffalo (269-469-4522). KIDS Unleash the rug rats at a U-pick farm during the summer months—they’ll have a blast gathering delicious fruit without realizing you’re using them as free labor. Only the Blueberry Patch (Holloway Dr, Sawyer; 269-426-4521; call ahead for hours) is located in Harbor Country, but several produce farms can be found in the surrounding areas at harborcountry.org/upick. WHERE TO STAY For reasonable prices on a nightly room, check out the popular Inn at Union Pier (9708 Berrien St, Union Pier, 269-469-4700; rooms start at $155). Or hatch a plan for a more luxurious stay: Gather up some friends and reserve a rental house. Try rsvp-rentals.com for a list of homes. WHERE IT IS The northeastern peninsula of Wisconsin, 250 miles north of Chicago. It was nicknamed “Door to the Way to Death” by French explorers because of its dangerous sea passage. SCENERY Often called “The Cape Cod of the Midwest,” Door County’s string of charming towns encompasses bluffs, forests, plains and sandy beaches. 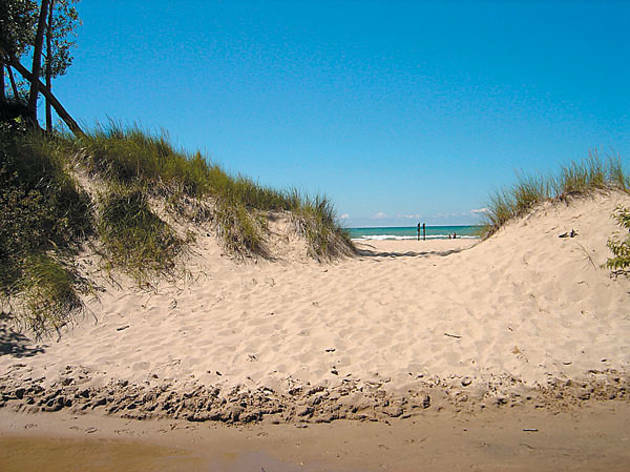 BEACH Hit 260 miles of shoreline at recreational beaches and five state parks, including Peninsula State Park with its 150-foot-tall bluffs that jut out of Green Bay and opportunities to bike, hike, boat, fish, golf, ski and swim. (920-868-3258). BUY Go for chintzy artwork, candles and housemade pies at the old-timey Settlement Shops in the quaint town of Fish Creek. 91106 State Rd 42 (920-868-2743). DON’T LEAVE WITHOUT… dining on Shoreline restaurant’s whitefish, freshly caught from local waters. The best part: taking in the great sunset views of Lake Michigan. 11996 Mink River Rd, Ellison Bay (920-854-2950). KIDS The tots will vacate the car immediately at the sight of Not Licked Yet, a colorful eatery hawking old-fashioned custard concocted with local ingredients. Let them work off that sugar high in the playground out back. 4054 State Highway 42, Fish Creek (920-868-2617). WHERE TO STAY Lodgings at Pioneer Lane innkeepers Hugh and Alicia Mulliken (parents of TOC office coordinator Carly) can advise you on Door County’s every nook and cranny. Whirlpools and fireplaces give the Swedish-style, five-room inn a luxury feel. Rooms $75 per night and up. 9998 Pioneer Lane, Ephraim (800-588-3565, lodgingsatpioneerlane.com).